Where Can I Buy Mulch in Southampton? Home > Where Can I Buy Mulch in Southampton? Do you want to improve the quality of your soil? If you are wondering ‘where can I buy mulch in Southampton?’ look no further than Abbey Turf. 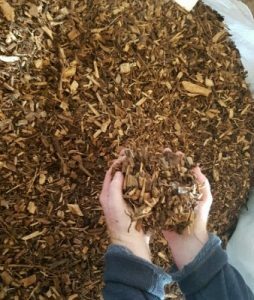 We provide affordable, organic mulch for you to use in your garden or agricultural land. Are you considering buying mulch but not sure how it will benefit you? We are here to tell you of all the advantages it has to offer your land in Southampton. Mulch is a great way to enrich your garden as it adds nutrients, and prevents existing nutrients from being washed away by rainwater. If you have planting in your garden that you want to keep in good condition, mulching is a sensible choice. The product can protect plant roots from harsh weather conditions. Additionally, it limits water evaporating from your soil, keeping it in good condition even during hot spells. Our Southampton Mulch also offers a number of aesthetic benefits. Bark chips, mulch, or similar matter can fill in empty gaps and borders without requiring a lot of maintenance unlike some alternatives. Mulch and wood chips tend to stay in place once laid, providing a neat yet practical top layer area for your Southampton land. Why buy mulch from Abbey Turf, Southampton? At Abbey Turf, we are Southampton’s leading suppliers for mulch, turf, and top soil. With over 25 years’ experience in the industry, we can make the best recommendations for how to improve the quality of your garden and lawn. We only use completely natural produce in our mulch so you can guarantee an organic and enriching layer for your garden. We supply mulch to both domestic and commercial clients including local authorities, golf clubs, and private customers. If you are a landscaper or tradesman in the industry, we can provide you with a trade discount, making our mulch excellent value for money. There are a number of different barks and mulches, but we can suggest the best one for your land. When you choose to buy mulch from our Southampton company, you can expect a prompt and efficient service. We will deliver however much mulch you need straight to your site at a time to suit you. Bark chippings are delivered per cubic metre, so just let us know how much land you wish to cover and leave the rest to us. If you wish to find out more about buying mulch in Southampton, give Abbey Turf a call on 02380 812302 or email us at info@abbeyturf.co.uk.